Lambeth School of Art was established in 1854 by William Gregory, vicar of St Mary the Less Church. 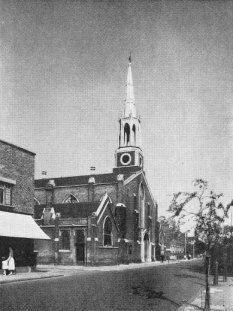 St Mary the Less Church was in Princes Road (now called Black Prince Road). It was demolished in the 1960s. At the end of the 1850s, the school was solely a night school. Dean Gregory was Rector, the Art Master was a Mr John Sparkes, and Edwin Bales was the modelling master. Then Henry Doulton became a mentor to the School. It was Sparkes who suggested the idea that the School and Doulton’s pottery company collaborate in making art pottery. Doulton took up the idea, and gave support to the School in the early period. Doulton’s began to manufacture ‘more or less artistic patterns for trade purposes’, adding art quality to everyday objects. As this became successful, Doulton began to take on many and sometimes nearly all of its pottery painters and modellers from the Lambeth School (including, among others, George Tinworth). Sparkes, went on to become Principal of the Royal College of Art in South Kensington. As well as potters, the Lambeth Art School also gained a reputation for training many important sculptors. This was particularly so under the modelling master W. S. Frith, whose students included George Frampton, Harry Bates, C. J. Allen, W. Goscombe John and F. W. Pomeroy. The animal sculptor J. M. Swan was also a student, and among a later generation of artists, Glyn Philpot. John Sparkes had also founded a sketching club at the School in 1861, and painters such as Charles Ricketts, C. H. Shannon and Raven Hill were members.